Get your church cross with names this Easter! 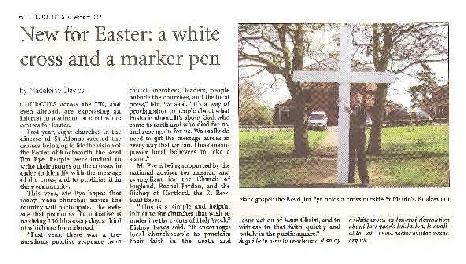 In October 2010 the Lord gave me a picture of large, white, wooden crosses, outside churches at Easter. These had names on them, giving people who believe that Jesus died for them the chance to identify with this and proclaim it within their community. I shared this with the Bishop of Hertford and leaders of Churches Together in Stevenage. They were all very encouraging, and we decided that this would take part within CTIS for Easter 2011, and there would be feedback before offering this to churches elsewhere for Easter 2012. Eight churches in the Stevenage area participated. They erected their crosses from Palm Sunday through to Good Friday. Some were left up for as long as two weeks. Most had names on when the crosses were erected. Some included this as part of a service and sang a hymn standing near the cross. On Easter Day one church decorated the cross by pinning on it different coloured ribbons as part of their morning service. At least one church offered the chance for passers by to add their names to the cross and left a marker pen for this. Some people added their name, others added bogus names, there was some graffiti, and a pen was stolen. Other than this there was no vandalism at any church. There was a tremendous, positive response from church members, leaders, people outside the churches, and the local press. The Mercury newspaper entitled their article, “Congregation gets cross with names”! The Bishop of Hertford, the Rt Revd Paul Bayes, said: “This is a simple and helpful initiative for churches which wish to underline the events of Holy Week where they are. It encourages local church people to proclaim their faith in the death and resurrection of Jesus Christ, and to witness to that faith quietly and boldly in the public square." Churches in England & Wales took part in 2012. If you are interested in taking part you might like to download a .pdf leaflet giving details, including instructions on how the cross could be made. You can also download a poster about the Easter White Crosses. If you do go ahead, please let us know by email detailing the name, location and web site address of the church where you will be displaying a white cross. These will feature on another page. Rev’d Jim Pye, Rector of Knebworth. Link to my sermons site with lectionary sermons updated every week, a library of over 300 sermons, sermon illustrations.